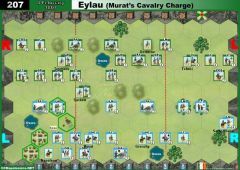 The die is cast for the Allied army. 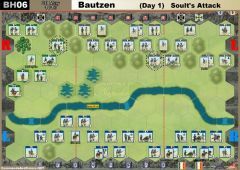 Nearly half of that army is concentrated on the southern part of the battlefield to force back Napoleon’s right flank. Despite determined French resistance, the Allies take Telnitz, cross the Goldbach Stream and are close to occupying the town of Sokolnitz. Suddenly, a change of fortune. Davout’s lead division has come into line. These are soldiers who had destroyed Merveldt’s Austrian division at Mariazell, and they fear nothing. 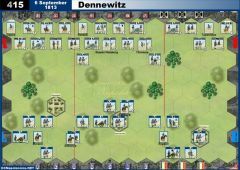 They launch a blistering counterattack that throws the Allies out of Sokolnitz and back across the Goldbach Stream. The ferocity of the attack confirms the need for yet more manpower. The Allied columns keep streaming south, unaware of the looming French threat to the center. 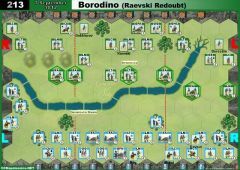 Now, fresh Allied troops storm back in to Sokolnitz and the Castle. 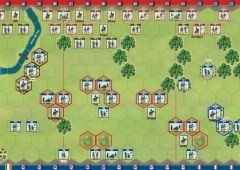 One of Davout’s fine regiments is virtually destroyed trying to defend them. 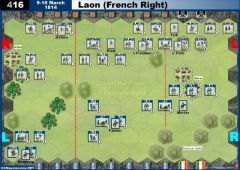 The remaining French soldiers go on to the defensive yet again, and hold off four times their numbers for the next several hours, guaranteeing that Napoleon will be able to split the Allied center. 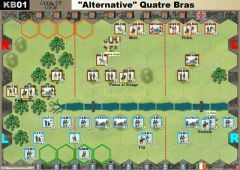 • The French player gains 1 Temporary Victory Banner at the start of the turn for each building hex occupied. 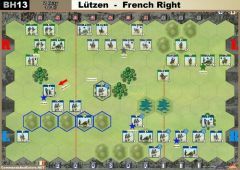 • The Allied player gains 2 Temporary Victory Banners at the start of the turn if the French do not occupy any building hexes. The Allies start with 2 Victory Banners. 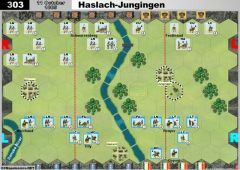 • The Goldbach Stream does not stop movement and there is no battle dice reduction battling into the stream. 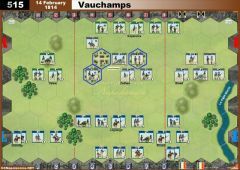 Units that battle out will fight at –1 die. • The Satschan Mere is impassable. • No Pre-Battle Mother Russia Roll. Played two games, switching sides. French won 10-2 the first, 10-1 the second. 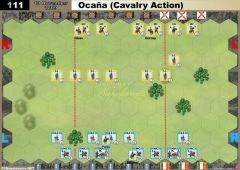 Conclusion: the Allies seem to have no hope, it does not matter if they play aggressively or on the defense. 2 games, 10-2 France both. Looking all one way. once russians get into command control reduction, its bad news. 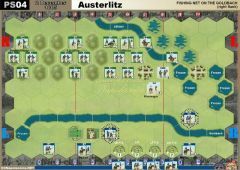 Ouch that one ... Hard to play in front of the Marshal who never lost any battle: DAVOUT!